ON Semiconductor (Nasdaq: ON), driving energy efficient innovations, has extended its RSL10 family of Bluetooth 5 certified radio System-on-Chips (SoCs) with a ready-to-use 6 x 8 x1.46 mm System-in-Package (SiP) module. Supporting Bluetooth low energy wireless profiles, RSL10 devices can be easily designed into any ‘connected’ application including sports / fitness or mHealth wearables, smart locks and appliances. 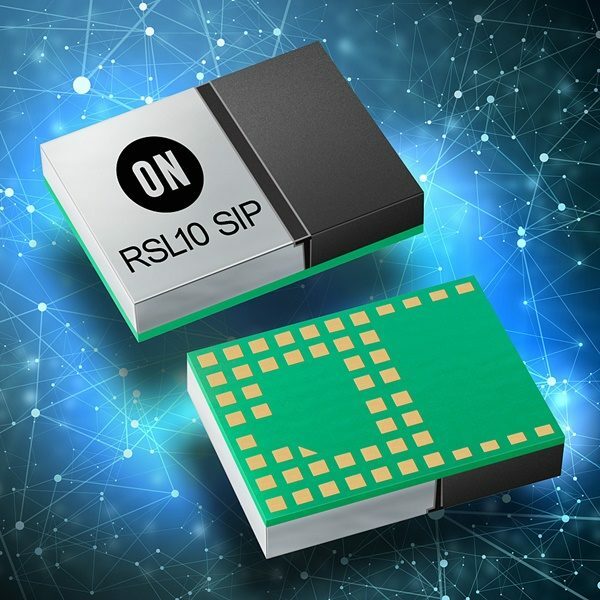 The RSL10 SIP features a built-in antenna, RSL10 radio, and all required passive components in one complete, miniature solution. Certified with the Bluetooth Special Interest Group (SIG), the RSL10 SIP significantly reduces time-to-market and development costs by removing the need for any additional RF design considerations. ON Semiconductor (Nasdaq: ON) is driving energy efficient innovations, empowering customers to reduce global energy use. The company is a leading supplier of semiconductor-based solutions, offering a comprehensive portfolio of energy efficient, power management, analog, sensors, logic, timing, connectivity, discrete, SoC and custom devices. The company’s products help engineers solve their unique design challenges in automotive, communications, computing, consumer, industrial, medical, aerospace and defense applications. ON Semiconductor operates a responsive, reliable, world-class supply chain and quality program, a robust compliance and ethics program, and a network of manufacturing facilities, sales offices and design centers in key markets throughout North America, Europe and the Asia Pacific regions. For more information, visithttp://www.onsemi.com.